The Empire State Building, the Eiffel Tower, the Great Wall; people travel around the world to see these examples of iconic architecture. A few months ago, I had the chance to travel to Malaysia. Though it was my first trip to Asia, period, I had heard the rumors about incredible temples, but I hadn't really heard much about more modern Malaysian architecture. Sure, the country is sandwiched between Singapore, Thailand, and Indonesia, but this quieter, less-touristed country has its own amazing sites. 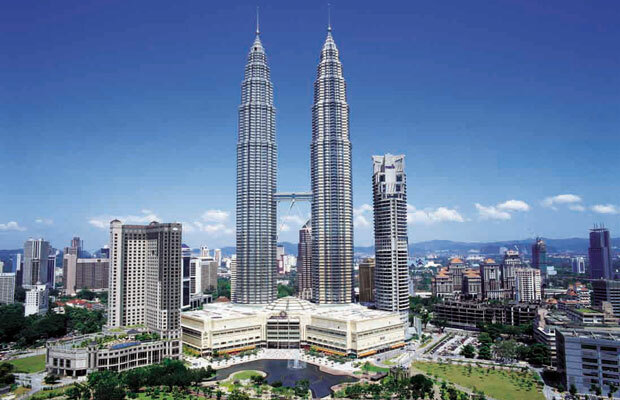 From the widely recognizable Petronas Twin Towers to the Borneo Convention Center (its design was inspired by the leaves of the ririk plant), here are just a few of the architectural wonders in Malaysia. While Langkawi, an archipelago of 99 islands, is known for its white, sandy beaches, the main island (Pulau Langkawi) is home to one of the most interesting structures in all of Malaysia. Set over 2,000 feet above sea level, this sky bridge winds through the rain forest and the peaks of Mount Mat Cincang. At over 400 feet long, the bridge is amazingly suspended by cables from a singular vertical support. To get to the bridge, take the 20-minute Langkawi Cable Car ride to the top of the mountain – an experience on its own – and enter the bridge. Of note: The bridge is currently closed for construction without an announced completion date, but you can admire it from the viewing platform on the mountain. On a clear day you can sometimes even see Thailand from there. Tengku Tengah Zaharah Mosque (or Masjid Terapung) is often referred to as the Floating Mosque because of the way it was built. 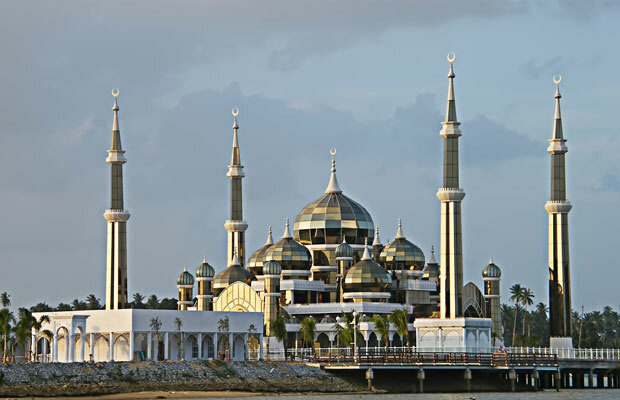 Constructed on an estuary of the Terengganu River, Tengku Tengah Zaharah Mosque combines Moorish architecture with a more modern feel – it is thought of as a representation of the "modernization of Terengganu state." Located less than three miles outside of Kuala Terengganu's center, the building incorporates classic Islamic design elements with local materials like marble and ceramic. If you're looking to visit, catch a local bus or taxi to the site. Plan to arrive in the early evening as the sun sets; it turns the building a golden hue. Arguably the most well-known buildings in Malaysia, Kuala Lumpur's Petronas Twin Towers soars high above the rest of the city's skyline. In fact, they're currently the tallest twin towers in the world. Take the elevators to the 41st floor for a view of the city from between the towers – the double-decker sky bridge provides a passageway between them. Up on the 86th floor, you'll stand over 1100 feet above ground. Fun fact: The design of the buildings are actually meant to showcase both Islamic patterns (the floor plan is based on simple Islamic geometric forms of two interlocking squares, creating a shape of eight-pointed stars) and cutting-edge technologies. 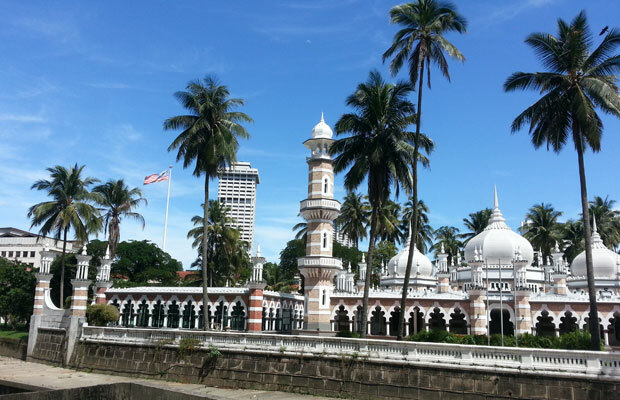 Once the National Mosque of Malaysia, Masjid Jamek is surrounded by palm trees and features traditional Moorish design detail, like the iconic white domes. The building is beautiful, even from the outside. There's no entrance fee, but the mosque is currently closed for renovations. (Like all mosques in Malaysia, proper attire is expected when it's open to visitors: Women should wear a long skirt or pants and long sleeves, and should cover their heads upon entering.) For now, you can still admire it from outside the walls. Nearby, check out Meredeka Square, which is home to some of the oldest buildings in the city, and the (alleged) tallest flagpole in the world. In Chinatown, explore the street markets and taste some authentic Chinese-Malay dishes. I recommend spending some time at the market on Jalan Petaling. Photos will never do this place justice. Just outside of Kuala Lumpur, seemingly out of nowhere, mountains begin poking up from the countryside. 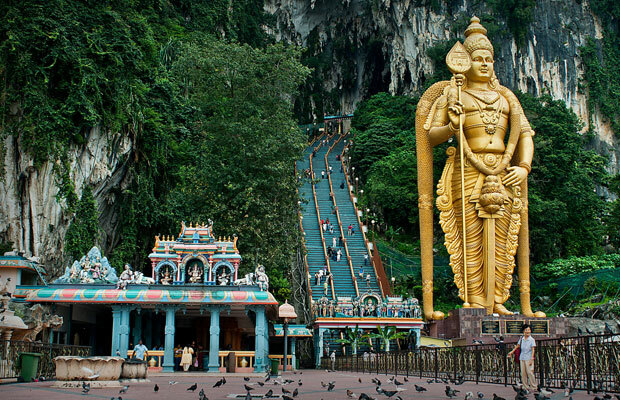 The statue outside the caves is the tallest statue of Lord Murugan (a Hindu god) in the world, at 140 feet. While not everyone makes the trek up the mountain and into the caves, I highly recommend it. I did it solo so as not to be distracted. After all, you'll have to climb 272 steep steps with fruits, flowers, and monkeys lining the sides. Go slow so you don't get dizzy (just looking at steps for that long can do that to you), and be sure to pause every now and then to take a photo behind you. The view of the city and the steps below is incredible. Once inside, explore the temples (you must take your shoes off) and gawk at the massiveness of the caves. Water trickles from the ceilings, so watch your step, and make sure to hold on to your belongings – the monkeys can get pretty hands-y. Entrance to the caves is free. Take a KTM Komuter Train here from KL Sentral (less than $1) to the caves or grab a taxi for more. While you can't exactly visit this state building, you can get a good look at the umbrella-like roof and architecture from outside. 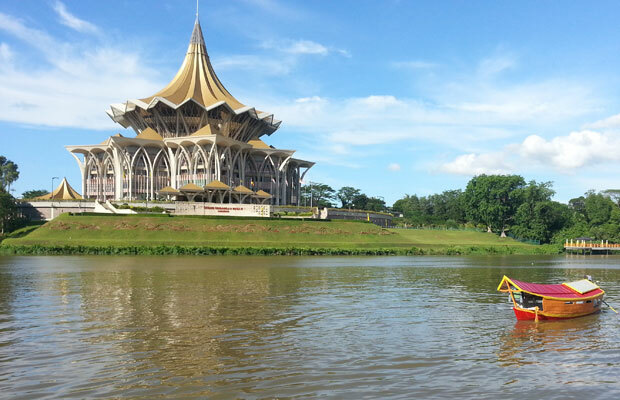 Located in Kuching on the island of Borneo, you'll come across the New Sarawak State Legislative Assembly Building as you're walking downtown. It can be seen prominently across the river. To get an especially good view, grab a water taxi (like the one pictured) and ask to be taken to the steps across from the building (where this photo was taken). Typically the taxis charge just 50 ringgit cents, but two friends and I convinced one to take us down river to this spot for just 2 ringgits each – less than a dollar for a private boat ride. Arguably one of the most unique mosques in the world, Masjid Kristal, or the Crystal Mosque, is constructed of steel and glass. 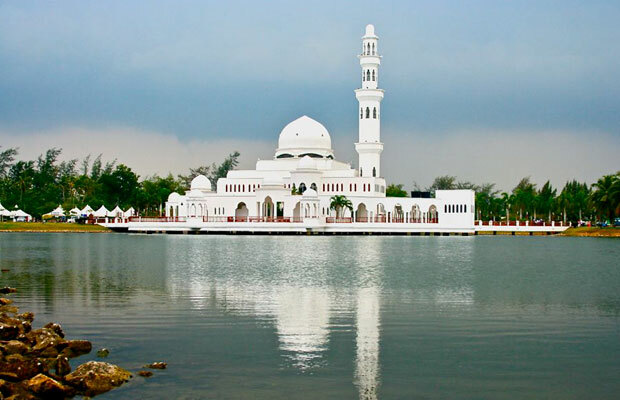 The mosque is located on Wan Man island at the Islamic Heritage Park in Kuala Terengganu. It's said that the best time to see the mosque is early in the morning or at dusk when the sun is setting. Be sure to watch from across the water for the best view. Accessible by taxi or boat, visit the mosque (free entry), along with other attractions on the island. The Monument Park has 21 small to-scale replicas of some of the world's most famous mosques.